We are instrumental in manufacturing and supplying a quality range of Designed Shopping Bags. These bags are manufactured using cent percent recycled cotton that is sourced from reliable vendors of market with the aid of our procuring agents. 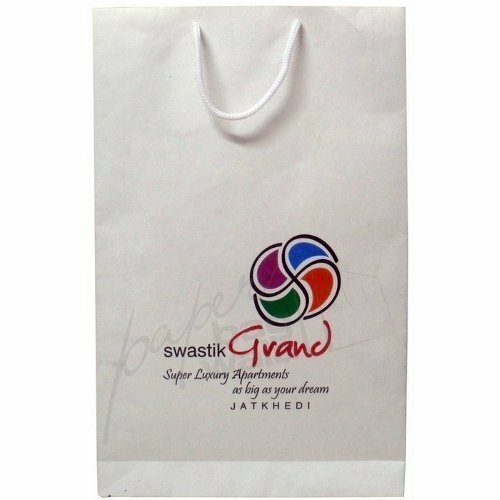 While manufacturing these bags, we consider various features such as bag dimension, base weight and print capability. Since 2008, Design Core Indore is recognized as a reliable organization that is engaged in manufacturing and supplying a vast array of Handmade, Laminated and Other Types of Bags. Our range of products encompasses Fashionable Handmade Bags, Crafted Handmade Bags, Handmade Paper Bags, Bleach Paper Square Bag, Colorful Rectangle Bags, Jewelery Gift Bag, Eco Friendly Crafted Bags, Eco Friendly Bags and Environment Friendly Bags. Also, we offer Colored Gift Bags, Rectangular Gift Bags, Fashionable Bags, Styles Craft Bags, Paper Crafted Bags, Bleach Craft Vertical Bag, Bleach Craft White Bag, Black Square Type Laminated Bag and Duplex Rectangle Type Gloss Laminated Bag. Being a patron based firm, we maximize the satisfaction level of our clients by offering them quality-approved products. Besides, we have developed a multifaceted infrastructure for carrying out the business operations in a smooth manner. This facility is installed with latest machines and equipment that are essentially required in the manufacturing process. Also, we have constructed a capacious warehousing unit for safe & systematic storage of the offered range. Owing to these reasons, we have build a vast client-base across the nation that includes Idea, Prakrit, Samsung, Big Bazaar, Paris Hilton and many more.